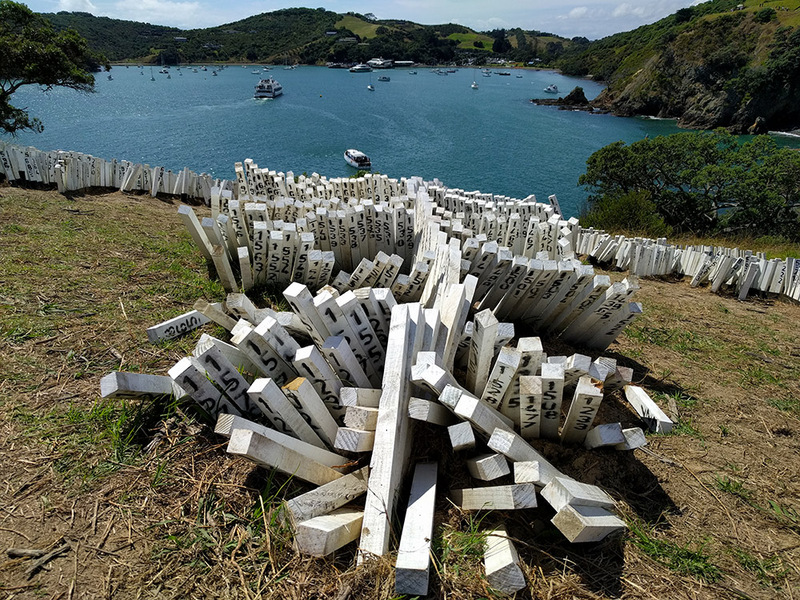 Yesterday I was asked by National Geographic to write a “letter from New Zealand.” When I thought about what I might write, I reflected that on Friday 15th, the day of the mosque attacks, I had kayaked to Waiheke to see the annual sculpture show, which sprawls along the coastal hills above Matiatia. I paid particular attention to one installation about Parihaka—a place and community and history I feel close to, having written at length about it. The installation, by Anton Forde, consists of 1881 survey pegs, the number referring to the year of the Parihaka invasion, and the pegs representing the issue that led up to the attack: government appropriation of Taranaki land, with surveyors the front-line agents of dispossession. *By the time the sculpture show closed in late March, 9000 people had participated as peg shifters. Such is the enduring resonance of Parihaka. Will atoll nations like Kiribati sink as sea level rises, or not? The prevailing media narrative—which you encounter everywhere: in print, on air, online—is yes. And that narrative nearly prevailed in the choice of headline for my Kiribati story in National Geographic’s just-published climate change special issue. I gulped. Only six months before I had written a story for National Geographic’s website that described scientific findings that more than 75 percent of atoll islands in the Pacific are maintaining their size or growing, despite slowly rising seas. I was deeply opposed to suggesting that these islands will soon be going down the oceanic gurgler. I discussed with my editor the idea of putting a question mark after “gone.” But the problem with doing that, I felt, was that the familiar slogan contained such a strong message that merely adding a squiggly piece of punctuation at the end would scarcely dent its impact. Psychologists have a term for this: confirmation bias, the tendency for the mind to interpret new information based on previous assumptions. Another cognitive bias (there are dozens of them; it’s surprising we can think straight at all, ever) would also come into play: the availability cascade, in which a collective belief gains increasing plausibility through constant repetition. Readers would expect to see a “disappearing islands” headline, I argued, and a question mark was unlikely to disturb that misperception. The editors approved the new headline, and the print magazine has duly been published with the title “Against the Tide” above the Kiribati story. 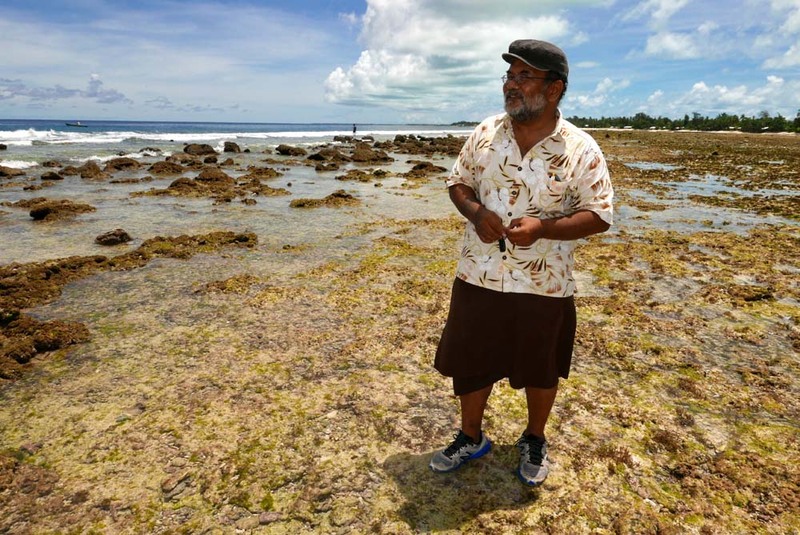 Meet Teweiariki Teaero—poet, artist, lexicographer, educator and candidate for parliament in Kiribati’s upcoming elections. Teweiariki—Tevi, for short—was an invaluable source of Kiribati traditional knowledge for me when I was in Tarawa researching my story on sea-level rise for National Geographic’s special issue on climate change. His account of the trinity of marawa, karawa and tarawa—sea, sky and land—formed a key part of my narrative. 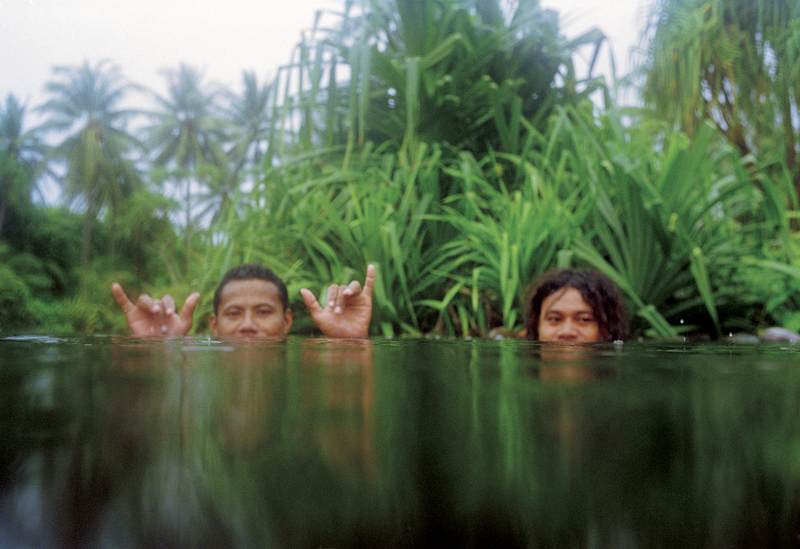 I was especially interested in the way that I-Kiribati think of marawa, the sea. Hau’ofa distilled this idea into a single memorable formulation: Pacific peoples do not view their world as islands in a far sea, but as a sea of islands. Clearly, Tevi and Epeli are paddling the same canoe. When sun, moon and earth are in alignment and in closest proximity to each other, the sea responds by producing the highest tides of the year, known as king tides. These tides can be 30 or 40 centimetres higher than a normal spring tide, and since that is the expected increase in global sea level by mid-century, today’s king tides show us what ordinary spring tides will be like in 2050. For low-lying atolls like Tarawa, capital of Kiribati, that new baseline will be a problem. 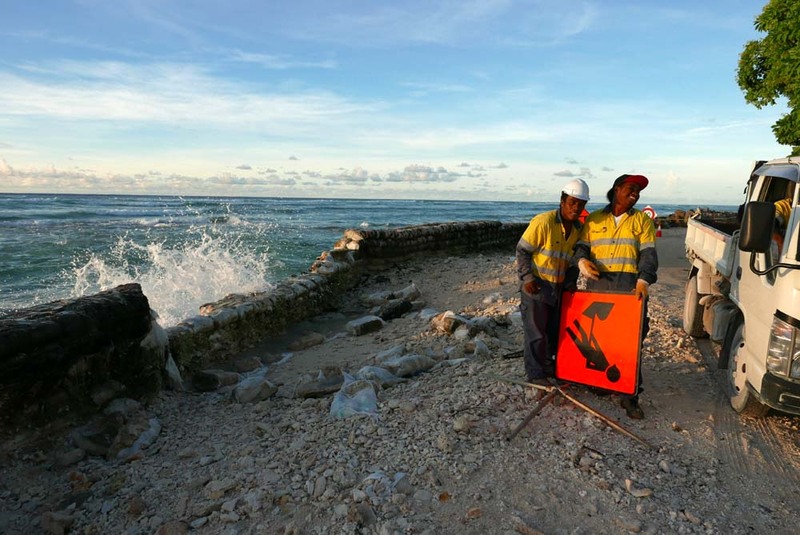 When I visited Tarawa in April 2015 to research a story on sea-level rise the islands were still repairing seawalls and re-armouring vulnerable areas of coastline after damage inflicted by a king tide in February. That event closed the maternity ward in one of Tarawa’s hospitals, not far from where a shipwreck was pushed ashore, piercing a seawall. Photographs I took of the damage and repair work have just been published on National Geographic’s website, here. The challenge for all low-lying atolls—indeed, for all coastlines—is that as the sea creeps higher, coastal defences such as seawalls and rock barricades will be more frequently and more severely tested, and in some cases the cost of protection will rise to untenable levels. In April of this year I spent some time in Tarawa, the capital of Kiribati, researching a story on Pacific Islands and sea-level rise for a National Geographic special issue on climate change. Much of the content of that issue, on sale in November, is now available online, including my Kiribati story. When a story, long in the production works, finally sees the light of day (or the light of a computer screen) it brings a flood of memories of people met, places seen, food eaten (sand worms!) and all the many experiences that a writer gathers up, like a fishing boat trolling through rich seas. I asked the man if he was a fisherman. He looked at me quizzically as if not quite grasping the word. He grinned. “Every man can catch fish,” he said. So they can, and do. Every day I watched men (and sometimes women and children) setting nets near the shores of Tarawa lagoon, then walking around splashing the water to scare fish into them. 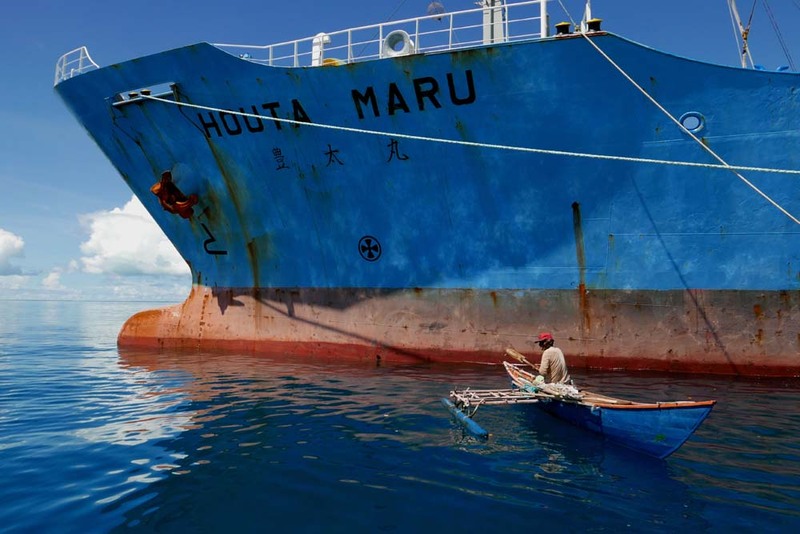 More serious fishers make overnight or multi-day trips to other atolls. I hired one group of fishers to take me to Abaiang Atoll, and recorded some of that experience in my story. On the way, we stopped beside a huge commercial tuna fishing vessel that was anchored in the lagoon to buy a few skipjack to use for bait. While we waited, an old man in a traditional outrigger canoe—known in Gilbertese as a wa—paddled past with the same idea. That’s him in the photograph above. I enjoyed seeing his feather-light handmade craft next to the industrial steel of the Japanese vessel, both painted the same lagoon blue. 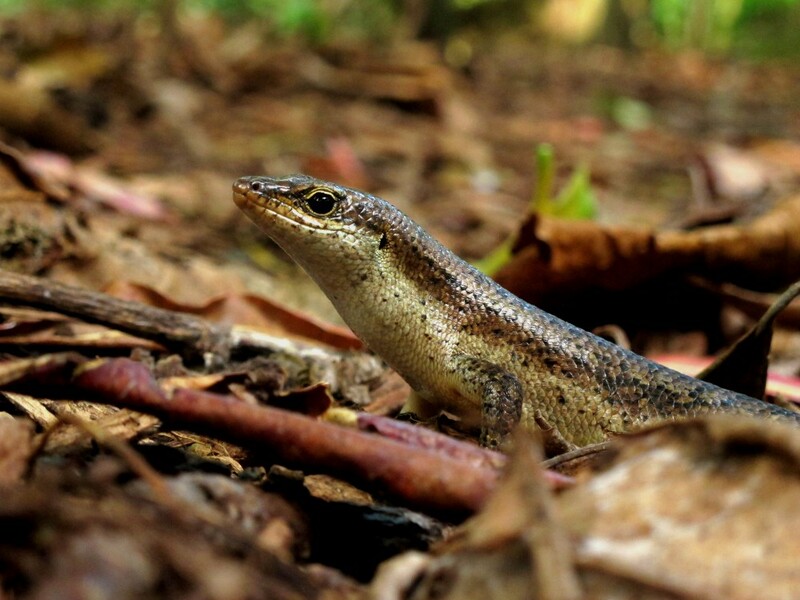 Traditional ways and modern ways rub shoulders uneasily in the islands. Perhaps they do everywhere. Climate change brings into sharp and painful focus the inescapable influence of the industrialised world on remote islands. Remote geographically, but not atmospherically, as we are now all aware. At the Paris climate summit in December, island leaders will try once more to sheet home the responsibility of the powerful developed nations to assist small island states to cope with the effects that global warming is already having, and will continue to have as the seas rise.